On October 27, 1895, Jefferson’s Academical Village suffered its only significant fire. 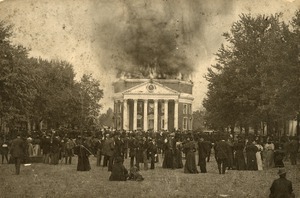 Starting in the Annex, the fire quickly engulfed the Rotunda. Despite the efforts of students, professors, and townspeople, the “School of Athens,” thousands of books, and all but portions of the exterior walls of the Annex and Rotunda were destroyed. Volunteers did prevent the fire from spreading to the rest of the Academical Village by dynamiting the walkways between the Rotunda and the pavilions and dousing the nearest pavilions with water. The destruction of the beloved icon and its subsequent reconstruction prompted new ways of thinking about architecture at the University that would endure for half a century.